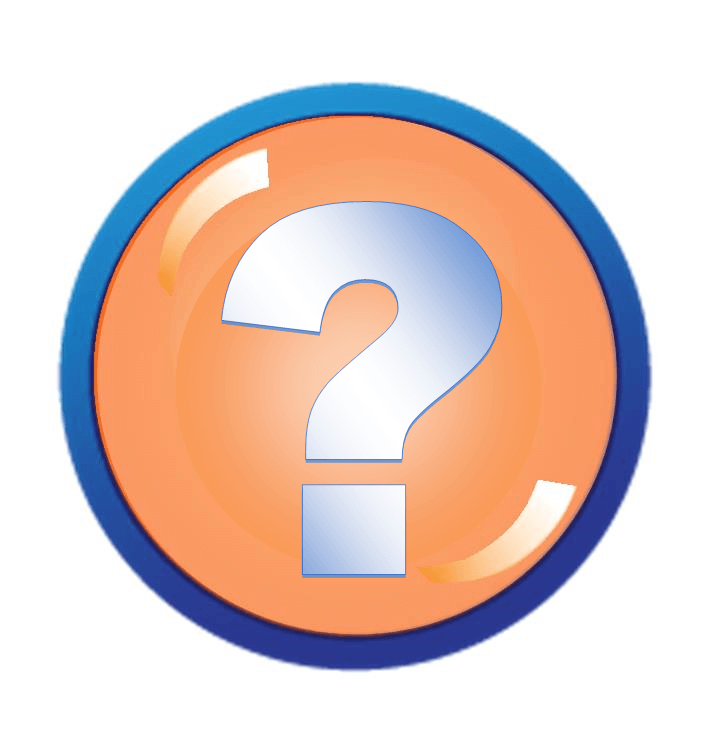 If you have a question, hopefully our Residential FAQs will answer it. If the FAQs listed below don’t answer your question, we’re just a phone call 866-746-3873 or and email away. How can I save money on long distance? OTELCO offers several optional calling plans, with options to fit every need and budget. For more information about in-state toll calling plans, please call our Customer Service team at 1-866-746-3873. A number of options are available. You can pay online, by mail, or in person. Please Note:On-Line Bill Pay is taken offline on the last day of the month and on the ninth at approximately 5:00 pm and remains offline until approximately 10:00 am the following day for billing purposes. It is also offline every morning from 3:00 am until 5:00 am for daily backups to the system. What should I do if I don’t recognize a number on my bill? Call your local business office. Your Customer Service Representative will happy to investigate the call and give you the name of the party called. If your bill dated the 1st of the month, your payment is due on the 5th of the next month. EXAMPLE: Bill date August 1st, payment due on September 5th. If you bill is dated the 10th of the the month, you payment is due on the 16th of the next month. EXAMPLE: Bill date August 10th, payment due on September 16th. How do I check my messages when I am away? Visit our website to log in. Remember, you will need to know your username and password. Open the Mail Program that you are using. Open a new e-mail window to send a new e-mail. Browse and when you find the attachment you want to send, highlight it by left clicking on it then click on the Attach button. How do I set up my additional mail boxes? or repeat the steps to create another new mailbox. I received an email from OTELCO asking for my username and password. What should I do? This is a scam! Delete Immediately! 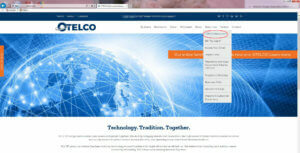 OTELCO would NEVER ask for you username and password by email. Is there a limit on how many recipients I can e-mail? 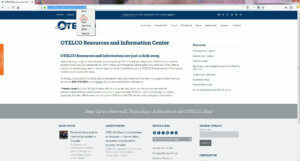 There is a rolling 150 recipient limitation for OTELCO e-mail every 5 minutes. Any e-mails that bounce back from being sent to an invalid recipient e-mail address counts as 10 recipients. If an e-mail account triggers this rate limit, please call the OTELCO NOC at 1-866-643-6246 to have this unblocked. What are the server settings for my email? 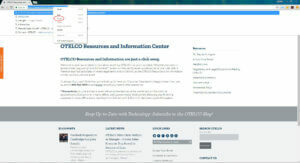 Webmail is a convenient way to check your OTELCO e-mail account from any computer with Internet access and a compatible web browser. What should I know about attachments? ALL mail in Web Mail counts against your mailbox quota. If you need to archive large messages, or large numbers of messages, consider using a standard mail program in conjunction with Web Mail. Large files can be very slow sending and downloading at the recipient’s end. Can I connect multiple PC’s to SecureSpeed? Yes! SecureSpeed users may connect as many PC’s as they desire to the service. Support is provided for the first workstation. SecureSpeed Professional users receive Support for up to five PC’s. An Ethernet hub and multiple Ethernet cards will be required. Can I still use the telephones I have now with SecureSpeed service? Yes! We will provide you with special filters that you install on each jack where you have a telephone. This filter separates DSL signals from phone service. Depending upon the current wiring installation in your home, inside wiring may or may not be required. DSL service is available in various levels up to 12mbps. The actual speed of the service you receive may vary depending upon your distance from the telephone company central office, and upon the condition of circuits in your area. I have ADSL and now I have noise on my phone? 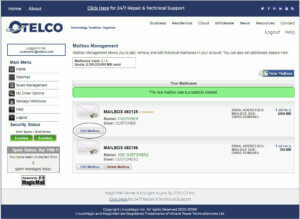 Make certain that every phone jack is equipped with the filters that OTELCO provided. You do NOT need a filter on the jack that supplies the DSL modem. SecureSpeed DSL versus cable modem service? What do I need to have DSL? 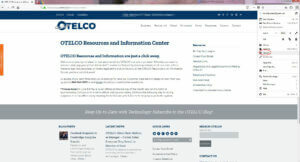 For the most effective operation of OTELCO broadband services, you’ll need Windows XP (or later) or Mac OS X, and an available Ethernet port. Digital Subscriber Line is a high-speed data service that is delivered over a standard phone line. Using digital technology, advanced services, such as high-speed internet access, can be delivered over the same phone line as standard telephone service. Where can I purchase a DSL modem? The modems that OTELCO employs are specially selected for optimum performance with SecureSpeed and are not available in retail stores. OTELCO broadband subscribers are assessed a monthly rental fee for a modem and never need to worry about repair or replacement of the unit. 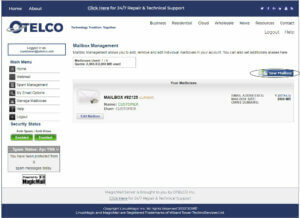 Subscribers who prefer to purchase a modem from OTELCO may do so at their own risk for repair or replacement. How do I avoid telemarketers? OTELCO offers a telemarketer block feature. Contact Customer Care at 866-746-3873 for more information. The Federal Trade Commission created the National Do Not Call Registry to help consumers control unwanted telemarketing calls. Placing your name on this registry can dramatically reduce the number of telemarketing calls you receive. To learn more, or to sign up for this registry, visit www.donotcall.gov or visit OTELCO Helpful Links for more information about Do Not Call and Do Not Mail lists. Step Two: Highlight the link in the address box and right click, then select copy. 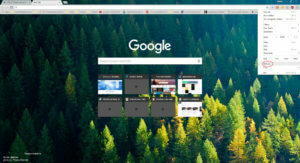 Step Three: In a new tab, open your browser settings. Step Four:Once in settings, find the side menu. Step Five: In the settings menu, go to “On Startup”. Step Six: Under “On Startup” make sure “Open a specific page or set of pages” is selected. Step Seven: Click “Add New Page”. Step Eight: In box right click again, and click paste. Step Nine: Once the address has been pasted into the box click add, and you are done. Step Two: Highlight the URL in the address bar, right click and choose copy. Step Three: In the upper right hand corner, click on the drop down menu and select “options”. Step Four: Under “General” go to “Home Page”. Right click, choose paste, and you are done. Step Two: Highlight the URL in the address bar, right click, and click copy. Step Three: In a new tab, go to the setting drop down menu and choose Internet options. Step Four: A new window will open. In the home page box right click, and choose paste. Step Five: Click “ok” and you are all set. FAQs specific to Leverett, Massachusetts municipal fiber network. Can I take my existing number with me to Leverettnet service? As long as the number is actively in service with another provider OTELCO can move (port) the number to the Leverettnet network. DO contact OTELCO to request the change. DO check out this diagram as you may need to make changes, and it may require you to hire an electrician. Our Customer Care staff will work with you to set up your Leverettnet services. ADDITIONALLY, for Verizon Wireless, the PIN # on the account. Once the Letter of Agency is returned to OTELCO, we will submit a request with number your current carrier to move the phone number. Once the request is made to your current provider, it can take between 3 and 5 business days for the switch to take effect. We will notify you of the exact date. On the specified date OTELCO will activate the number in the Leverettnet system and make a test call to ensure that it’s operating properly. Although this process cancels your phone service with your other provider without further action from you, IT DOES NOT CANCEL any other services with that provider. If you have other services with that provider like that you no longer need or want,, you will need to call them to request those cancellations after your new Leverettnet service is installed and operating properly. LeverettNet.net is the domain name of the fiber-optic broadband network serving residents and businesses in the Town of Leverett, Massachusetts. Leverett Municipal Light Plant, the custodian of LeverettNet. Click here more information. The MLP is a municipal entity under Massachusetts law, established to provide utilities (gas, electricity, telecommunications) to residents and businesses. MLP budget and administration is separate and distinct from the general town budget and administration (similar to an enterprise fund). What is the NO (Network Operator)? The Network Operator is an entity that monitors the performance of the network and takes corrective action in the event the network is not functioning properly. Holyoke Gas & Electric Telecom Division is the NO for LeverettNet. The Town of Leverett owns the network. What is an ISP (Internet Services Provider)? The ISP is an entity that provides Internet service over the network. 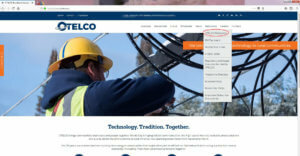 OTELCO is the ISP for LeverettNet. What services are available over LeverettNet? Internet service with 1Gps (one gigabit per second) symmetrical (upload and download) access to the 2Gbps (two gigabits per second) “middle-mile,” with no data cap. Includes up to 5 email boxes. Telephone service with unlimited calling to the contiguous 48 states, Canada, Puerto Rico, Alaska, Hawaii, US Virgin Islands, Guam, and N. Mariana Islands. Calls outside the unlimited area will be billed at posted international rates. 2. A tutorial will prompt you to set up your new password. 3. You will now be prompted to record your name. 4. You will now have the option to record a personalized busy and no answer greeting. Please Note: When calling VM from your home phone, by default, there is no access password required. Should you wish for the system to require a password for voicemail access, please call 866-746-3873 and customer care will set that up for you. g) Press # To save the message anytime while listening, or at the end of the message. How Do I Use Standard Calling Features? International Block Please call 866-746-3873 for a PIN that will allow you to make an international call. How Do I Use Premium Features? 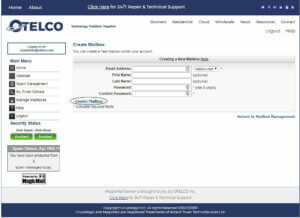 You can manage the following features at the OTELCO secure web portal. Please call 1-866-746-3873 Option 1 for activation and password. Selective Call Acceptance Allows you to define the telephone numbers that will be allowed to reach your telephone number. If an incoming telephone number is on the list, the call will complete to the your phone. All other calls are blocked and the inbound caller is informed that the user does not wish to receive the call. Selective Call Rejection Enables a user to define the telephone numbers that will not be allowed to reach the users telephone number. If an incoming telephone number is on the list, the call is blocked and the caller is informed that the user is not accepting calls. Call Notify Allows you to define criteria that cause certain incoming calls to trigger an e-mail notification or a short message to a cell phone. If an incoming call meets your specified criteria, a notification is sent informing the you of the details of the incoming call attempt. Sequential Ring Allows you to define a “find-me” list of phone numbers that are alerted sequentially for incoming calls. While the service searches for the you, the calling party is provided with a greeting followed by periodic comfort announcements. The caller can also interrupt the search to leave a message by pressing a specified key. Simultaneous Ring Allows you to have multiple phones ring simultaneously for their inbound calls. For example, inbound calls to your home phone could also ring to your mobile phone. Broadworks Anywhere This extends your phone services so that you can make or receive calls from any other fixed phone or mobile phone number. The following feature needs to be managed by our Customer Care Team. 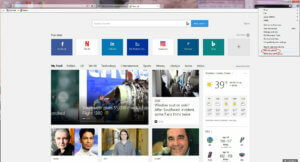 What television options exist on LeverettNet? LeverettNet does not offer separate television service (often referred to as cable), but does provide access to television and video streaming services over the Internet (sometimes referred to as video “over the top”). Video streaming services include Netflix, Hulu, HBO, Amazon Video, Vudu, YouTube, Sling TV, and many others. Some satellite television providers—like Dish TV and Directtv—also provide access via an Internet connection, without needing a satellite dish. ‘Smart’ TVs and stand-alone streaming media hardware devices—for example, Roku, Apple TV, Chromecast, Fire TV Stick, etc.—allow television sets to connect to “over-the-top” content. An October 2016 report from The New York Times and the Wirecutter offers product recommendations and a guide to streaming television and video content over the Internet. 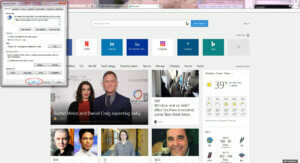 More information about television streaming is available in the News and Information section of this website. What email options exist on LeverettNet? Other email accounts (gmail, yahoo, etc . . .) can be used separately or forwarded to a leverettnet address (or vice versa). *Some email clients will have a checkbox that says “require authentication”, make sure to check that. 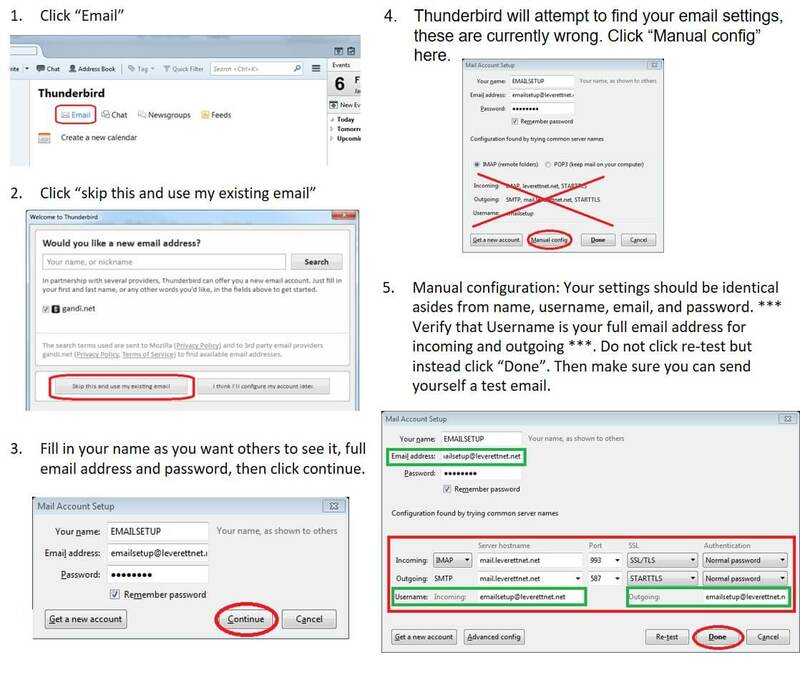 After downloading Mozilla Thunderbird please follow the steps listed below to setup your Email Account. What inside premises wiring is needed for telephone connections? Telephone wire pairing. Click image to view larger. The ONT provides connection ports for telephone as well as for Ethernet. The jack on your existing telephone wiring will unplug from the telephone company service box and plug directly into a telephone port in the ONT (behind the outer weatherproof door). 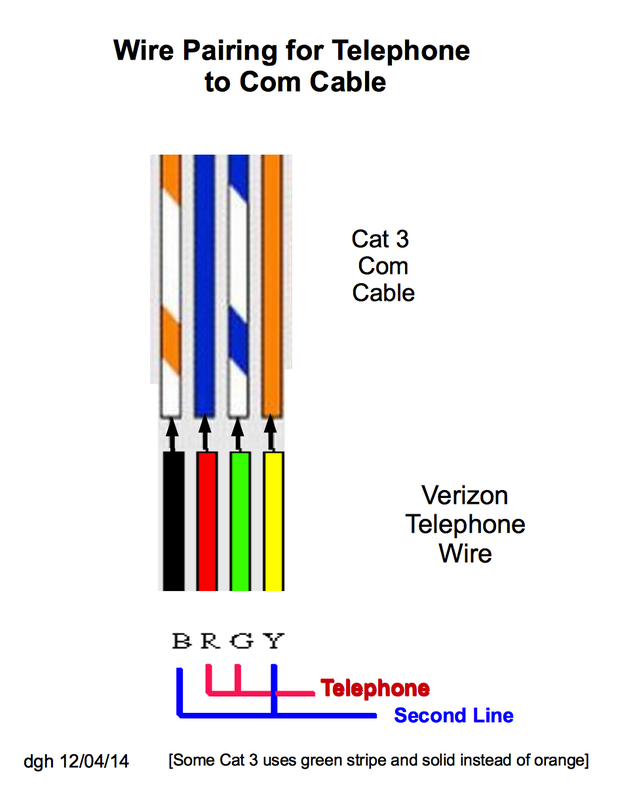 If you install new telephone wiring from the ONT to connect to existing telephone wiring inside your house, the following diagram shows the most common situation. In the event you end up with spare wires, cut the ends cleanly and wrap them back around the wire casing. What inside premises wiring is needed for Internet connections? 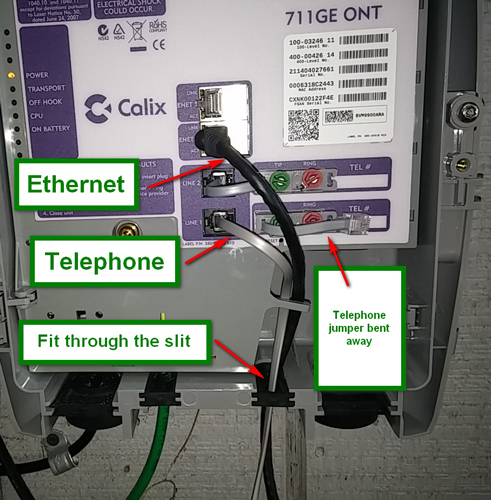 Fiber-to-the-home premises equipment and wiring. Click image to view larger. The ONT converts signals carried as pulses of light on the optical fiber into electrical signals carried over low voltage twisted pair wire copper wiring referred to as “Ethernet” wiring. Ethernet carries the electrical signals from a port on the ONT to the subscriber’s equipment, typically a router. 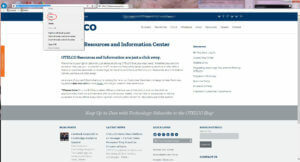 For network administration and security reasons, you should not connect a computer directly to the ONT, unless you are requested to do so by a service technician. The data rate of the signals to and from the ONT is one gigabit per second (that is, one thousand million bits transferred over the wire per second), often abbreviated as gbs. Categories of ethernet wire suitable for that data rate are Cat 5 and higher. Cat 5e is normally considered entirely suitable for all but the longest and most interference-prone installations. A typical residential network will connect computers, printers, and other devices via wired jacks or wirelessly. In either instance, a router will be connected by Ethernet wire to an Ethernet port in the ONT (behind the outer weatherproof door) and will serve the inside network via wireless or a mix of wireless and wired connections. Ethernet wiring can be installed by electricians, but may also be installed by others having appropriate skills. It is not highly complex to install. The most critical factors are that the cable must not be allowed to kink or be secured so tightly that it is crushed. What is the ONT (Optical Network Terminal)? ONT connections. Click image to view larger. The ONT is a network interface device used with fiber-optic systems. The ONT is the demarcation point between the LeverettNet fiber-optic network and the subscriber premises Ethernet wiring to the subscriber router, which serves the subscriber’s devices. The ONT converts optical signals into electrical signals, and vice-versa. The ONT terminates the fiber optic line in an inner compartment and the premises Ethernet and telephone wiring in an outer compartment. The ONT is powered from the subscriber premises electrical system, through an uninterruptible power supply (UPS) unit. NOTE: The ONT is the property of the Town of Leverett. It is not to be painted, moved, adjusted, or tampered with. The homeowner may access only the outer compartment behind the weatherproof exterior door—which is secured by an ordinary slotted screw—for ports to connect premises Ethernet and telephone wiring. Operational status lights are visible in this outer compartment. How do I subscribe for services or call for customer support? To subscribe or for billing and other non-technical matters, contact the ISP, OTELCO at 1-866-746-3873; press 2, Monday – Friday 8:00 AM – 5:00 PM. If it’s more convenient, drop a note. If you are having connection issues please select Technical Support from the drop-down below. If you have general questions about products, services or billing, or want to add or change service, please select either Residential or Business Customer Care (whichever applies). Please tell us why you're writing and provide any preferred contact information. How do I get service at a new house or location? Collins will track installation time and the actual cost may be lower or higher. Collins will provide a specific cost estimate, for a fee of $150. Homeowner must provide 120-volt outlet for UPS. Homeowner is responsible for interior network wiring (Ethernet, router, etc.). To initiate the process for a new connection to LeverettNet, submit a complete and signed LMLP Homeowner Easement and Right of Access Form to Town Hall, Leverett. Contact Town Administrator Margie McGinnis 413-548-9699 for further information. Can I subscribe to more than one LeverettNet account? The ONT has two Ethernet ports and two telephone ports, where the homeowner’s cable(s) connect to inside wiring. Each port can be provisioned by the ISP to carry a separate Internet or telephone subscription. Arrangements for additional LeverettNet accounts can be made directly with the ISP. It is also possible to arrange with the ISP to install an ONT with more than two ports for even more subscriptions. May I resell the use of my LeverettNet connection? The Leverett Municipal Light Plant as a matter of policy forbids resale of a LeverettNet connection. Anyone seeking a commercial arrangement for LeverettNet usage should contact the LMLP, which will review requests and, if approved, establish terms that ensure network build, maintenance, and operating costs are shared appropriately. How do I locate the path of buried fiber on my property? A survey plan for the aerial or underground path of a fiber “drop” to a subscriber location is completed prior to the installation. This plan shows the approximate path to be taken and provides a good reference to use when searching for the conduit. This plan is on file with the LMLP in Town Hall. Contact the LMLP to see a copy of the plan for your location. NOTE: The actual path of the cable is subject to conditions discovered in the course of the trenching work and for this reason may be found far from the path shown by the plan. Underground drops are enclosed in an orange-colored conduit, buried approximately five to twelve inches below the surface. The best practice for digging anywhere between the roadway and the house ONT installation is to dig by hand for the first twelve inches of depth. The homeowner is responsible for costs to repair fiber broken or damaged by digging or other interference. Where do I report a problem like a tree down on a fiber cable? Use the Tree Trim or Removal Request Form on this website to report trees that are endangering cables. Your report will be sent to the LMLP, the Leverett Tree Warden, and the electric company to remedy the problem. Contact OTELCO by phone 866-746-3873 option 1 or Email. Fiber To The _______ is a generic term for any broadband network architecture using optical fiber to provide all or part of a last mile telecommunications system. 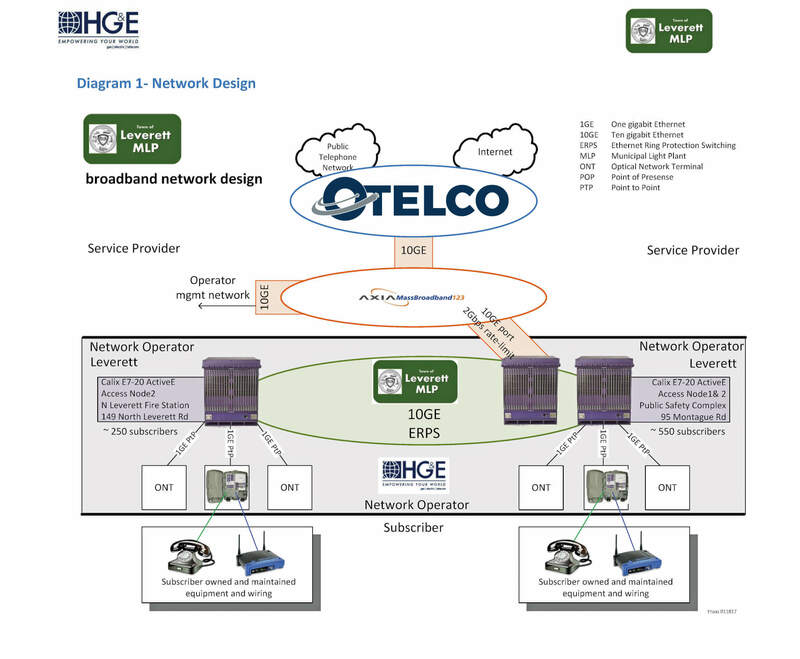 Fiber-to-the-home (FTTH) refers to fiber optic cable connections to individual residences; also known as Fiber-to-the-premise (FTTP): LeverettNet deploys this architecture. Fiber-to-the-curb (FTTC) refers to fiber optic cable extended along a street or road, passing individual premises. Optical fiber is a strand of glass about as thin as a human hair that transmits light pulses carrying digital information. The light pulses are generated, received, and converted from / to electrical signals by electronic equipment at each end of the fiber, to form a communications network. Fibers are grouped in bundles in cables throughout the network. Optical fiber is less expensive and lighter weight than copper wires and can transmit more data with less power and signal degradation over longer distances. Optical fiber is electrically non-conductive and not subject to electromagnetic interference. What is a Gigabit (Gb)? A Gigabit of Internet bandwidth is 1,000 Megabits (Mb). A Gigabit network can provide data transfer rates of one gigabit per second (Gbps) over fiber. Most end-user devices process data at slower speeds than fiber. Gigabit as a measure of bandwidth is not to be confused with Gigabit as a measure of data. Bandwidth (what engineers call bitrate) refers to data transfer rates: or how fast information can move between devices. A Gigabit of data, in contrast, is a measurement of quantity: one billion bits of data. It takes eight bits (referred to as a byte) to store a single character of text. Symmetrical Bandwidth refers to equal upload and download speed. Download (or downstream) bandwidth is the path that brings information from the network to a subscriber’s device. Upload (or upstream) is the path that carries information from the subscriber’s device into the network. All Internet activity involves both paths. Video streaming is an example of an activity that uses more downstream than up. Cloud services, telehealth, and video conferencing are examples of activities that use up and down streams more evenly and may use upstream more than down. Do I need a modem in addition to a router? No, you do not need a modem. The ONT serves the same purpose as a modem. What is an UPS (Uninterruptible Power Supply)? UPS (Uninterruptible Power Supply): contains a battery backup to provide short-term power to the ONT in the event of a grid power outage. Converts AC (alternating current) from the electrical grid into DC (direct current) to the ONT and keeps the battery charged. The apparatus provides surge protection and filtering to correct some common utility grid problems—voltage and frequency instabilities. The UPS is connected to the ONT with two power wires and five signal wires. 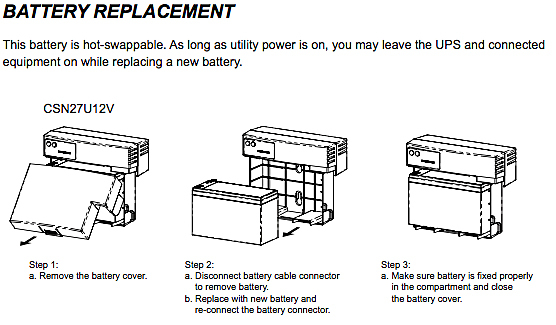 The battery in the UPS unit is a sealed, maintenance-free lead-acid type. What do the indicator lights mean on the UPS? Your UPS provides indicator lights to let you know how it’s operating. Uninterruptible power supply indicator lights. Click image to view larger. The ONT sends UPS status signals to the Calix Management System (CMS) and can be monitored by the Internet Service Provider (ISP). The subscriber may replace the battery directly or contact an electrician. Two local electricians are certified by LeverettNet to work on ONT and UPS issues: Ryan Gahagan [Grace Electrical Services, 860-805-3683] and Lee Edelberg [H. 413-549-8963; C. 413-522-0356]. How do I replace the UPS battery myself? The UPS battery charges when it is connected to utility power. The battery charges fully during the first 24 hours of normal operation. Do not expect full battery run capability during this initial charge period. The battery is hot-swappable. You may replace it while UPS is connected. See diagram below for details. UPS battery replacement. Click image to view larger. What battery do I use for replacement? Use a Sealed, Maintenance Free Lead-Acid Battery with 12Vdc 7 amp-hour output. This battery may be purchased at a local electrical supply store or online [12vdc 7ah sealed lead acid battery]. Using an incorrect battery may cause damage or risk of energy hazard. What is the Point of Presence? A Point of Presence is a demarcation and access point to the Internet. It is a physical location that houses electronic equipment necessary to connect the “last mile” network to the “middle mile,” which connects through the ISP to the Internet. What is the Middle Mile? The Middle Mile is the network that provides connectivity from local “last mile” networks to the Internet. 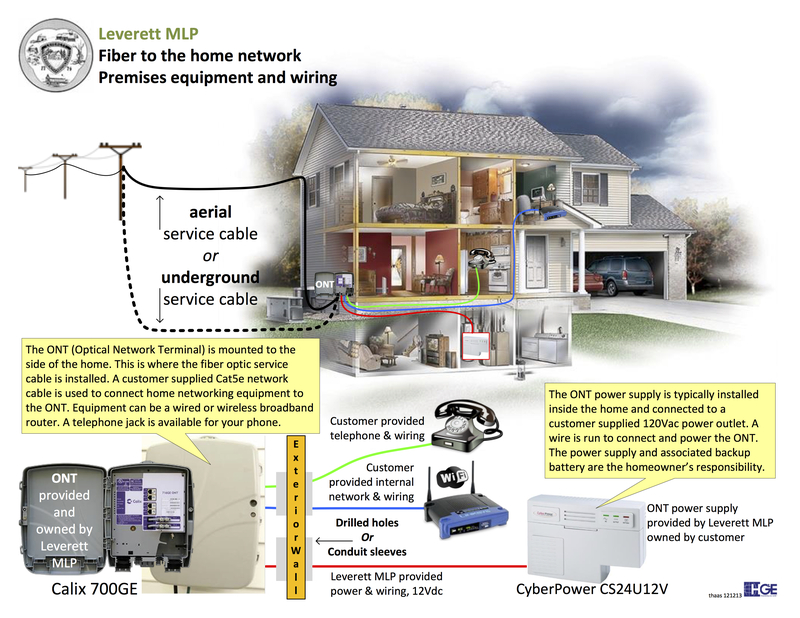 The “middle mile” for LeverettNet is owned by the Massachusetts Broadband Institute and operated by Axia NGNetworks. An Active Ethernet network provides each subscriber with their own fiber link to the network node switch, which links the local network to the Internet. In comparison, a GPON network uses passive optical splitters to connect up to 32 subscribers to a single fiber link to the network node. AE makes higher bandwidth possible by the direct link from the switch to the subscriber. LeverettNet employs AE. delay in LeverettNet and/or the Internet beyond LeverettNet and/or websites, due to traffic congestion, rerouting, etc. note that wireless is inherently slower than wired; optimize by locating access point closer to devices and with fewer barriers; use different frequencies from cordless phones; etc. A number of mechanisms are built into the LeverettNet network nodes and ONTs to enhance network security. Security features configured on the Leverettnet network include, but are not limited to, MAC forced forwarding, Multicast Filtering, IP DHCP Option82, IGMP snooping, IP Source Verify and limited scope VLANS. The Network Operator has deployed these features globally across the network. Additionally, the network has the ability to prioritize certain types of traffic over others. For example – telephone takes priority over Internet. For more information about how the Network Operator monitors LeverettNet, click here.